The first time I went into St. Bart’s, I did so just to see if it was all one floor inside. It is, and the high ceiling provides such good acoustics that the church has been known to double as a recording studio! It is allegedly built to the dimensions of Noah’s ark, though you might be sceptical about anything that shape being able to float. I pass close to this place on a regular basis, and I often try to imagine what it must have looked like when it was first built, and how much it would have dominated the area around it. St. Bartholomew’s is open to the public most days, and entry is free (although donations are appreciated). St Bartholomew’s I believe to be the highest church in England. 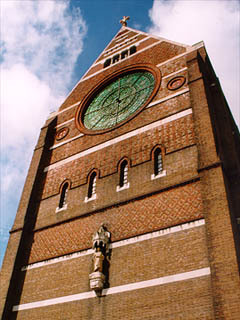 St Bartholomew was also known as Nathaniel and was brought to Jesus by one of the apostles. It’s so good to see that wonderful huge old building being noticed more and more. I am an old Brightonian now living in Essex. I grew up under the immense shade of that great church and even went to school there for a while. It was to have been 90 feet tall but the dedicated builders went on….and on… to the 135 foot height we now see. It was built to allow free access (no pews, no fees) for all to worship. It is a smashing place, beautiful, peaceful and inspiring. It appears on telly from time to time, and I have hopes that, one day, one of the musical events will be broadcast. Good luck to you, Ian, and thanks again. My love to Brighton, her pubs and people. I used to sing in this church from time to time a few years ago. It is very much worth a visit to see the amazing gold mosaics and the altar area, Victorian splendour, and also a tribute to those who built it. Someone told me that it was built by the same people who built the railway viaducts. It’s certainly in the same enormous scale, and style. I went to school at St. Bartholomews from the early 70s until 1980. Both the school and the Church hold wonderful memories for me, even now, when I enter the Church I am overcome with awe and feel like I should whisper. We had a service in the Church every Thursday (I think) and we had to wear our coats as it was so cold. I’ve never heard the organ working to my disappointment and I remember being repremanded for turning around to stare at it when a service was going on. I was baptised at the font in about 1979 on Mothers Day by one of the Bishops who came especially to hold the Mother’s Day service. I was 10 at the time I think. I always wanted to get married there too, however, I did that in Las Vegas instead. I’m proud to be a Brightonian and saddened at the number of beautiful buildings from my childhood that are disappearing. However, I’m fairly sure St.Bartholomews isn’t going anywhere for a while yet. While I had very little formal musical training (my family could not have afforded it) I owe much that I do know, and the inspiration to practice music ,to George Austin, who was the peripatetic music teacher at the Lewes grammar schools respectively for boys and girls in the period from the 1940s until the late 1950s. A magnificent player with outstanding skills as a sight reader and musical theorist, George was a scion of the musical family of Worcester, the name of which he bore, and studied at the cathedral there with the redoubtable Ivor Atkins. The well known arrangement of the Three Kings, attributed to Atkins, was actually written as an exercise by George. I turned pages for him several times at recitals in Brighton, Croydon and London. He spent some time at St. Martin in the Fields and was especially known for his work at Christ Church, Lancaster Gate, whose choir alumni formed a group, The Old Gaters, which he occasionally conducted with the baton given to him by Sir Thomas Armstrong. In the 1930s, George was the repetiteur at Glyndbourne Opera and gave recitals on the organ in the Organ Room. He also gave recitals at Blenheim Palace, at fashion shows, in the presence of the patron and organiser, Princess Margaret. At some time in his career George was a cellist in the Birmingham Symphony Orchestra. As a chorister at St. Bart’s. in his time and that of Andrew Teague and others, I was privileged to sing an exceptionally wide range of music. In 1981 I met my now wife in the choir there, she being a refugee from St. Paul’s (at which church I also sang on many occasions). My work as a professional, university historian, has not prevented me from continuing to sing and to be the director of two cathedral choirs (including directing one of them in Chichester Cathedral and elsewhere in 1991), a madrigal choir, and a special choir giving occasional concerts of music not often done here where I live (Lennox Berkeley, Edmund Rubbra, Francis Grier and the like). One of my best memories of George and St. Bart’s was to see and here the duet of Austin and Newall George’s both and the latter blind) performing the Schumann piano concerto in A minor in the gallery of the church, with Austin playing his part on the organ from a minature orchestral score! I have only just seen the comment above written by Robin Swales. I too have very special memories of the late George Austin and have much to thank him for. He was such an inspirational music teacher at St. Bartholomew’s school where I attended from 1964 to 1970. The pupils went to Mass at St. Bartholomew’s church Thursday mornings (as they continue to do) and George Austin would play the organ. Music was always one of my favourite lessons at school and George Austin really helped me with his encouragement and praise. I can also remember him having a great sense of humour and making me laugh. I sing at the Annunciation church, which is a few minutes walk away from St. Bartholomew’s, in the Hanover area of Brighton. However, I will always keep links with both St. Bartholomew’s school and church. My three children have all attended the school, as did my late mother and many other family members over many years. I have also been a school governor there for approximately 13 years. My late uncle John Bishop attended St. Bartholomew’s church all of his life where he served on the alter until he became too unwell in the last stage of his life and he died in 2003. I, too, have memories of George Austin. At Lewes County Grammar School he struggled to awaken musical interest in unruly boys but I think succeeded in a few cases. Probably he was more appreciated among the staff, at least one of whom (Keith Herbert) was involved with Glyndebourne. When I started at Lewes in 1954 George had us singing and learning some of the elements of music. Later he agreed to play some records brought in by boys, starting with the latest in the then novel hit parade. I brought along some jazz, which he gave some credit (although he was scathing in his criticism of an Australian cover of Pete Daily’s “South” which I brought in, criticism lost on me at the time. If any of us knew he was a great music scholar and accomplished organist nothing was made of that to our knowledge, at any rate so far as I was aware. I left Lewes in 1957. In the early ’60s, when I was living in Brighton, I met him on a London train and we had a long chat, mostly about music, the sequel to which was that I was the privileged audience of one his morning recitals (i.e., practice) of modern French music, which he then explained to me. I had never before listened to or discussed atonal music, and it stimulated an interest. I was left with the impression that although George seemed a somewhat lonely man in the conventional sense, he was sustained by his music. I suppose St Bart’s may have been his spiritual home for some years, and it is enriching to read the above notes about him.